it isn\'t working thanks to these rings. 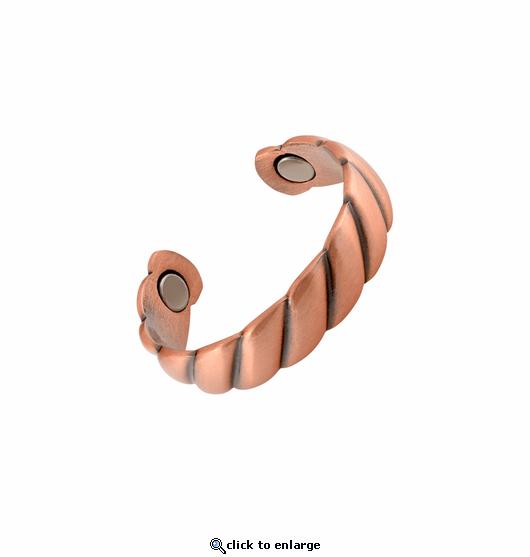 I purchased two of the magnetic copper rings because they are working so well for me. One I kept the other I gave to a friend that also has arthritis. She does a lot of sewing and said it has helped a great deal. again he is afraid to try to spread the ring apart enough to fit on his other fingers besides the little finger-- do any of them come bigger? Reply by MJS: We only offer the ring in the one size stated in the description to fit finger ring sizes about 6 - 9. We are glad to accept return or exchange if you wish. Much more than expected. Very sturdy and so very pretty. I was delighted with this ring. Much stronger and higher quality than expected. Yes, it works. I didn't sleep with it one night and woke up stiff and sore. I love the looks of this ring. I did notice one day that it turned my finger green. I still will keep wearing it anyway.Reply by MJS: What you have experienced is completely normal with copper. Favorite of the three rings I purchased. I am love this product and very recomended to everyone ! turned my finger green. Reply by MJS: That is very common with real copper. We are glad to accept return or exchange if you wish. Adjustable Magnetic ring twist, etc. Have ordered several times here - always pleased with the items & prices & fast shipping - only thing is I wish you had some larger adjustable rings to fit larger fingers like mine - the ones that I have gotten from you I wear as pinky rings. I am a massage therapist and use the ring at the end of the day to ease the finger joints. When I first received the ring, I asked a client who has arthritis in her thumb joints to wear the ring during her session. She was sold on the power of the magnetic world! I liked this ring so much that I purchased the matching bracelet. Very nice ring, thank you.